Bedrooms: 2 doubles with extra single bed in each, 3 doubles, 2 twins, and one triple. Built in the 18th century, La Bastide des Plaines is a magnificent Provençal country house where many impressive original features have been retained as focal points of the sophisticated and lavish interior. The house stands in 3 hectares (7.5 acres) of landscaped garden and grounds, including charming dining terraces, a large swimming pool with a pool house and an all-weather tennis court. There are lovely views of the surrounding hills. To let you know that we've had a glorious week at "La Bastide des Plaines". The villa was exceptionally comfortable and well-equipped, the housekeeper/property manager and her husband charming and very informative, and Patrick (the cook you found for us) prepared and cooked for us 3 delicious dinners - a perfect holiday! A wonderful property with everything necessary to entertain all age groups. Set in its own extensive grounds, we spent a perfect week in this very comfortable and lovely house. Entrance Hallway – leading into corridors to all the ground floor rooms and with stairs ascending to the first floor. At the end of the hall is a WC with a washbasin. Kitchen – very spacious, light and modern, with a breakfast table seating 8 people and windows facing south and west. The kitchen is equipped with an electric cooker with 5 hobs, large ovens and an overhead extractor; double sinks and a dishwasher; a microwave; a fridge/freezer; a Nespresso coffee maker, toaster, electric kettle, etc. A Larder is adjacent to the kitchen and access is via a Laundry Room, with a large washing machine, a separate dryer, double sinks, an iron and ironing board. Dining Room – leading off the Kitchen and featuring an imposing, working stone fireplace and a formal dining table seating 16. Sitting Room – large and comfortable with a honey-coloured stone wall, sofas, armchairs and a large, widescreen Canal+ satellite TV, plus a Blue-Ray DVD Player. A staircase also ascends to the Master Bedroom. Billiards Room – with a full size table, balls, cues and overhead lights, as well as armchairs and a CD player and a collection of CD’s. Bedroom 1 – with a child’s bed and an interconnecting door to Bedroom 2, which has a high, arched ceiling, a 5’6” double bed and ensuite Shower Room (1) with a walk-in shower, twin washbasins and a W.C. Bedroom 3 – located at the top of the stairs, with two 3’single beds, a window facing south and ensuite Shower Room (2), with a walk-in shower, a wash basin and a W.C. Bedroom 4 – the huge Master Bedroom, with a 6’ double bed and windows facing south and east, plus a staircase which descends to the Sitting Room. Bedroom 5 – a large room with two 3’ single beds and a French window facing east. Bathroom 1 – modern in style, with a bath, a wash basin and a W.C. Bedroom 6 - with a 6’6” bed and a window facing west. Bedroom 7 - with two 3’ single beds and a window facing east. Shower Room 3 - with a walk-in shower and double wash basins. A separate WC is adjacent to the shower room. Bedroom 8 - with a 5’6” double bed, windows facing south and an ensuite Bathroom (2). Bedroom 9 - with a 5’6” double bed, a window facing north and an ensuite Shower Room (4) with a walk-in shower, a wash basin and a W.C.
From a quiet country road, electronic entrance gates open into a 350-metre drive to the rear of La Bastide des Plaines where there is plenty of parking space. On arrival, tenants will be given a 'fob’ for the gates. The house is sheltered on all sides by immense plane trees, oaks, limes, chestnuts and others. The house is surrounded by lawns, a wide variety of shrubs and an olive grove. A key feature is the state-of-the art, all-weather tennis court, and a tennis instructor/coach can be arranged. There are at least 4 racquets and many balls, although their condition may not be very good. For other outdoor recreation, there is also table tennis and a set of ‘boules’. 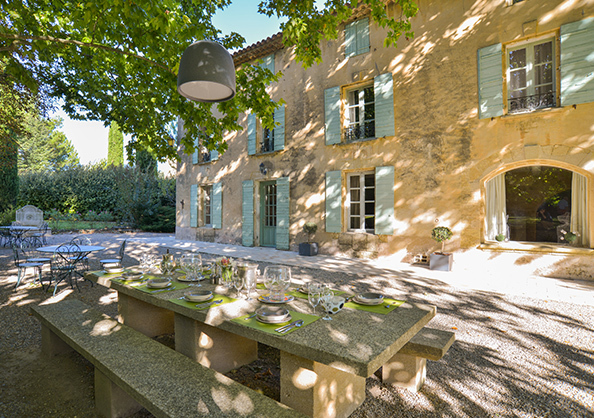 On the south side of the house, a large gravel terrace, with a pretty ornamental fountain, features a large stone dining table, shaded by trees, which seats 20, plus 2 wrought-iron bistro tables which each seats 5. The kitchen opens onto this terrace, making it ideal for breakfasts al fresco. A more formal dining terrace is located on the east side of the house with a table seating 8, comfortable wicker chairs and lovely views of the garden which can be floodlit. 50 metres from the house is the fenced and gated, heated swimming pool, measuring 16x6 metres, with a depth of 90 cms at the shallow end and 1.7 metres at the other. Wide, Roman steps into the shallow end make access easier for toddlers. The sunbeds, mattresses and the 2 large sun umbrellas can be arranged around the pool, either on the stone tiled area or on the close cropped lawn. The pool is filtered and has an electronically operated cover, both for safety’s sake, and to maintain the water temperature. The pool is fenced with a secure metal fence and can be locked for children's safety. At the far end of pool is a cool, stone Pool House, with comfortable seating, a small fridge, a sink and a shower. Children’s swings are also close to the pool area. La Bastide des Plaines is 3.5 kms north of the charming, large village of Rognes on the borders of the Luberon ‘departement’ of Provence. The house is located off a small, virtually unused lane, which in turn leads from the fairly quiet D543. The village of Rognes provides good shopping, and is especially known for its truffle market. The nearest supermarkets are at Lambesc and Lourmarin, both 9 kms. Rognes is 12 kms west of the A51 autoroute (exit 15), and 60 kms (1 hour’s drive) from Marseilles international airport (Marignane). The superfast train, the TGV, stops at Aix-en-Provence (45 minutes). Tenants will be greeted on arrival and shown around, both inside and outside. The cleaners are Roselyne and Laure. Between them, they will do 9 hours per week on a total of 3 mid-week days. Any extra hours of work including laundry and/or ironing should be agreed with them, and will be charged at Euros 17 per hour. Garden and pool maintenance are paid for by the owners. A cook and/or a babysitter can be arranged with advance notice. His/her/their wage will be the tenants’ responsibility and can be ascertained prior to the commencement of the tenancy. Bed linen, bath and pool towels and provided, and will be changed every Saturday. There is underfloor heating throughout the house, other than in Bedrooms 5,6 & 7 where electric convectors are provided. The walls are thick and the windows shuttered, keeping the interior cool on the hottest days and warm in winter. There are hair-dryers and fans in every bathroom or shower room, plus 2 cots with bedding and 2 high chairs. There are some puzzles, a chess board, packs of playing cards, and some children's DVD's. There’s a house telephone, as well as Broadband/WiFi internet access. (Please bear in mind, however, that La Bastide is a very rural property, and whilst every effort is made to provide Broadband/WiFi internet access at all times, it cannot be guaranteed). There are English and French language books throughout the house. A very useful house manual contains the telephone numbers of a doctor, a dentist, the emergency services, markets, local attractions etc. The house manual contains helpful information including when and where local markets take place, details of nearby supermarkets, shops and their specialities, recommended restaurants in various price categories, and the many things to see and do in the surrounding area. There’s a Tourist Office in Rognes which also provides much useful advice and information. This is spectacular walking country and the house manual provides details of walks in the surrounding National Parks. The nearest golf courses are: Pont Royal Golf Club, Mallemort (18 holes), and Set Golf Club, Aix-en-Provence (9 holes). Both are about 20 kms. Canoeing, kayaking, dinghy sailing and rafting is an option on the local rivers and lakes. Arguably the best point of hire is at Foxtaine-de-Vaucluse on the Sorgue river (25 kms). These lakes also offer swimming from sandy beaches, whilst several have restaurants on their shores. Bicycles can be hired on the village of Villelaure (10 kms), and can be delivered and collected from the "Bastide". The spectacular Gorges du Verdon, Europe's Grand Canyon, offers adventure activities of many kinds. Vineyards abound in the region and most offer tours, tastings and on-the-spot purchases. Many local lavender farms also offer tours and sell a range of gifts. There are many hugely photogenic small towns and villages to explore in the surrounding area - Bonnieux, Saignon, Vaugines (where Jean de Florette and Manon des Sources were filmed), Lourmarin, Lacoste (with the Marquis de Sade’s castle), Ansouis, Apt, Roussillon, L’Isle-sur-la-Sorgue, Ménerbes and Gordes, to name but some. The historic cities and cultural centres of Aix-en-Provence, Nîmes and Avignon make excellent days out. There are distinguished music festivals in all of them, particularly in Aix. La Roque d’Athéron (4 kms) has an international Piano Festival each August. There are numerous châteaux, abbeys, churches, gardens, art galleries, museums and archaeological sites that are well worth a visit, as well as many cultural and sporting events taking place in the surrounding area. The best Mediterranean beaches within easy reach are in the 'calanques' (coves) to the west of Cassis, as well as the larger beaches east of this small coastal town, several of which have windsurfing, waterskiing and sailing facilities. Cassis also has some good seafood restaurants. The house manual provides details of local children's zoos and adventure playgrounds as well as paintballing and a labyrinth in La Roque d’Anthéron. Many grottoes and caves in the area include features from their fascinating, pre-historic past. The house manual provides details of the nearest golf courses as well as the nearest riding stables, where lessons and treks can be arranged. Flying, ballooning and parapenting are exhilarating ways to admire the spectacular scenery of the Luberon. May, Easter & Christmas/New Year £6,370. There shall not be more than 16 people (including babies and toddlers) staying at “La Bastide” at any time. Small pets are allowed (on request). Except by prior arrangement, all tenancies will be for a minimum of 1 week, and will begin and end on a Saturday. Tenants should arrive as soon as possible after 4pm on the commencement day, and must leave before 10am on the agreed day of departure. They will be greeted on arrival. A Booking and Security Deposit of £500 will also be payable to Anglo French Properties Ltd on signing this Rental Agreement. This will secure the booking, and will cover the cost of (a) telephone calls made on the landline during the tenancy, (b) replacing/making good any losses, breakages and/or damages incurred during the rental, (c) the cost of underfloor heating in the colder months, and (d) any exceptional cleaning work which may be required at the end of the tenancy. This Deposit will be refunded (less any deductions as outlined above) within 4 weeks of the tenancy’s conclusion.